خدابخشی, مجید, محمودی, مسعود. (1397). مطالعه استحکام اتصال لایه ای در کامپوزیت SS316/Al 1050 تولید شده به روش فرآیند اتصال نورد تجمعی. علوم و فناوری کامپوزیت, 5(4), 479-484. مجید خدابخشی; مسعود محمودی. "مطالعه استحکام اتصال لایه ای در کامپوزیت SS316/Al 1050 تولید شده به روش فرآیند اتصال نورد تجمعی". علوم و فناوری کامپوزیت, 5, 4, 1397, 479-484. خدابخشی, مجید, محمودی, مسعود. (1397). 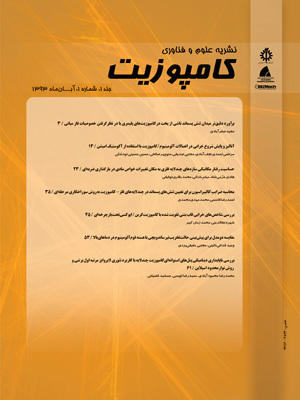 'مطالعه استحکام اتصال لایه ای در کامپوزیت SS316/Al 1050 تولید شده به روش فرآیند اتصال نورد تجمعی', علوم و فناوری کامپوزیت, 5(4), pp. 479-484. خدابخشی, مجید, محمودی, مسعود. مطالعه استحکام اتصال لایه ای در کامپوزیت SS316/Al 1050 تولید شده به روش فرآیند اتصال نورد تجمعی. علوم و فناوری کامپوزیت, 1397; 5(4): 479-484. در این مقاله به مطالعه استحکام لایه ای در کامپوزیت آلومینیوم AA1050 و فولاد SS 316 تولید شده به روش فرآیند اتصال نورد تجمعی پرداخته شده است. نمونه های فرآیند نورد تجمعی به منظور بررسی استحکام لایه کنی و برشی تحت آزمون کشش تک محور در جهت نورد قرار گرفتند . استحکام لایه ای در هر نمونه اندازه گیری و نتایج حاصل از آزمایش ها با یکدیگر مقایسه شدند . نتایج نشان داد که استحکام در برش لایه ای نسبت به لایه کنی بیشتر بوده است؛ همچنین پس از انجام 5 پاس فرآیند نورد تجمعی، ریز ساختار ورق مشاهده شد. به منظور بررسی استحکام نمونه ها طی پاس های مختلف فرآیند، آزمون های کشش انجام شدند که نتایج، به طور کلی بیانگر افزایش استحکام بودند. مطالعات بعدی بر روی تصاویر میکروسکوپ الکترونی روبشی مقاطع شکست نمونه های حاصل نشان داد که با افزایش پاس های فرآیند، ضخامت لایه های فولاد کمتر گشته تا این لایه ها در پاس 3 به پارگی رسیدند. در ادامه تغییرات سختی در راستای ضخامت ورق، در پاس های متوالی مطالعه شدند. نتایج حاکی از آن بودند که در پاس 2 افزایش سختی چشمگیر بوده است. This paper studies the shear and peel strength of composite AA1050 aluminum and SS 316 steel manufactured by accumulative roll bonding (ARB) process. The ARB samples were tested for shear and peel strength under a single axial tensile test. The layer strength was measured in each sample and the results of the experiments were compared. The results showed that the shear strength of layers was higher than the peel strength; also the microstructure of the sheet after performing 5 cycles of the ARB process was observed. To test the strength of the samples during different passes of the process, tensile tests were carried out; the results indicated a general increase in strength. Further studies on the scanning electron microscope (SEM) images of the fracture sections of the samples showed that by increasing the number of passes, the thickness of the steel layers was less than that in the pass 3 of these layers to tear. In the following, hardness changes along the sheet thickness were studied in successive passes. The results indicated that the pass 2 had an impressive increase in hardness. Moradgholi, J. Monshi, A. and Farmanesh, K., “Comparison of microstructure, toughness, mechanical properties and work hardening of titanium/TiO2 and titanium/SiC composites manufactured by accumulative roll bonding (ARB) process” Journal of Ceramics International, Vol. 43, No. 10, pp. 7701–7709, 2017. Talebian, M. and Alizade, M., “Manufacturing Al/steel multilayered composite by accumulative roll bonding and the effects of subsequent annealing on the microstructural and mechanical characteristics” Journal of Materials Science and Engineering, Vol. 590, pp. 186-193, 2014. Ghafari-Gousheh, S. Hossein Nedjad, S. and Khalil-Allafi, J., “Tensile properties and interfacial bonding of multi-layered, high-purity titanium strips fabricated by ARB process” Journal of the Mechanical Behavior of Biomedical Materials, Vol. 51, pp. 147-153, 2015. Valiev, RZ. Islamgaliev, RK. and Alexandrov, IV., “Bulk nanostructured materials from severe plastic deformation” Progress in Materials Science, Vol. 45, pp. 103-189, 2000. Zhilyaev, AP. and Langdon, TG., “Using high-pressure torsion for metal processing: fundamentals and applications” Progress in Materials Science, Vol. 53, pp. 893–979, 2008. Gashti, SO. Fattah-alhosseini A. and Mazaheri Y., “Microstructure, mechanical properties and electrochemical behavior of AA1050 processed by accumulative roll bonding (ARB)” Journal of Alloys and Compounds, Vol. 688, pp. 44-55, 2016. Jamaati, R. Toroghinejad, MR. and Edris, H., “Effect of SiC nanoparticles on the mechanical properties of steel-based nanocomposite produced by accumulative roll bonding process” Journal of Materials and Design, Vol. 54, pp.168–173, 2014. Yu, H. Su, L. and Lu, C., “Enhanced mechanical properties of ARB-processed aluminum alloy 6061 sheets by subsequent asymmetric cryorolling and ageing” Materials Science and Engineering, Vol. 674, pp 256-261, 2016. Lee, SH. saito, Y. Tsuji, N. Utsunomiya, H. and sakai, T., “Role of shear strain in ultra-grain refinement by accumulative roll-bonding (ARB) process” Journal Scripta Materialia, Vol. 46, No. 4, pp. 281-285, 2002. Saito, Y. Tsuji, N. Utsunomiya, H. Sakai, T. and Hong RG., “Ultra-fine grained bulk aluminum produced by accumulative roll-bonding process” Scripta Materialia, Vol. 39, pp. 1221–7, 1998. Naseri, M. Reihanian, M. and Borhani, E., “Effect of strain path on microstructure, deformation texture and mechanical properties of nano/ultrafine grained AA1050 processed by accumulative roll bonding” Materials Science & Engineering A, Vol. 673, pp. 288-298, 2016. Mashhadi, A. Atrian, A. and Ghalandari, L., "Mechanical and microstructural investigation of Zn/Sn multilayered composites fabricated by accumulative roll bonding (ARB) process" Journal of Alloys and Compounds, Vol. 43, pp. 1314-1323, 2017. Kümmel, F. Höppel, H. and Göken, M., "Layer architecture and fatigue life of ultrafine-grained laminated metal composites consisting of different aluminum alloys" Materials Science & Engineering A, Vol. 702, pp. 406-413, 2017. ElMahallawy, N. Fathy, A. Abdelaziem, W. and Hassan, M., "Microstructure evolution and mechanical properties of Al/Al–12%Si multilayer processed by accumulative roll bonding (ARB)" Materials Science & Engineering A, Vol. 647, pp. 127-135, 2015. Milner, JL. Bunget, C. Abu Farha, F. Kurfess, Th. and Hammond, VH., “Modeling tensile strength of materials processed by accumulative roll bonding” Journal of Manufacturing Processes, Vol. 15, pp. 219–226, 2013. Gashti, SO. Fattah-alhosseini, A. Mazaheri, Y. and Keshavarz, MK., “Microstructure, mechanical properties and electrochemical behavior of AA1050 processed by accumulative roll bonding (ARB)” Journal of Alloys and Compounds, Vol. 688, pp. 44-55, 2016. Eitner, U., “The Mechanical Theory behind the Peel Test” Energy Procedia, Vol. 55, pp. 331-335, 2014. EN ISO Standard #6507-1, Vickers hardness standard test for Metallic materials , 1997. Dehghan, M. Qods, F. and Gerdooei, M., “Effective of Accumulative roll bonding proses whit inter-cycle heat treatment on micro hardness of AA1050 Alloy” Key Engineering Materials, Vols. 531-532, pp. 623-626, 2013. Dehsorkhi, RN. and Qods, F. Tajally, M., “Investigation on microstructure and mechanical properties of Al–Zn Composite during accumulative roll bonding (ARB) process” Materials Science and Engineering, Vol. 530, pp. 63-72, 2011. Hosseini, SA. Danesh, and Manesh, H., “High-strength, high-conductivity ultra-fine grains commercial pure copper produced by ARB process” Materials & Design, Vol. 30, No. 8, pp. 2911-2918, 2009. Teixeirade Freitas, S. Banea, MD. and Budhe, S., “Interface adhesion assessment of composite-to-metal bonded joints under salt spray conditions using peel tests” Composite Structures, Vol. 164, pp. 68–75, 2017. Naseri, M. Reihanian, M. and Borhani, E., “Bonding behavior during cold roll-cladding of tri-layered Al/brass/Al composite” Journal of Manufacturing Processes, Vol. 24, No. 1, pp. 125-137, 2016.